As Becky Hammon left the floor after her team's series-opening loss in the WNBA Finals her rookie season, New York Liberty coach Richie Adubato approached her to apologize. Adubato had left Hammon on the bench the entire second half that day because he feared a doe-eyed rookie couldn't handle a moment that big as well as experienced starting guards would. "I told Becky, 'Sorry I didn't get you in,'" Adubato recalled. "Since it was our only home game in the series, we were facing the best team in the league and we had to win, I thought maybe it was a little too much pressure for her to handle. She looked me in the eyes and said, 'Coach, don't ever worry about putting me in tough situations. You're going to find out that I thrive on pressure.'" 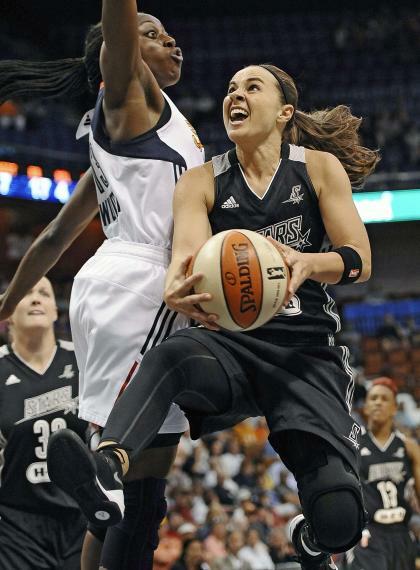 Not being intimidated easily is about to come in handy again for Hammon because the 16-year WNBA veteran and seven-time all-star will soon step into a more pressure-packed role than any she has previously experienced. The San Antonio Spurs announced Tuesday they're hiring Hammon as the NBA's first full-time female assistant coach, a job that comes with the extra burden of success or failure being seen as a barometer for whether women can thrive in a domain that has traditionally been all-male. Winning respect in a risk-averse, testosterone-rich league will not be easy for Hammon, but female coaches are lucky to have her as their trailblazer. She is extremely well prepared for her new position because of the time she has already spent around the Spurs organization and the experience of trying to make it in women's basketball as an undersized, slow-footed guard from South Dakota. In seven seasons as a point guard with the WNBA's San Antonio Stars, Hammon has sat in on numerous Spurs practices and film sessions and earned the trust of the NBA's most revered coach. Before that, Hammon grew accustomed to being underestimated after not being selected in the WNBA draft or recruited by any high-profile colleges. "In my own personal journey, there have been things that have equipped me for this moment," Hammon said on a conference call with reporters Tuesday. "Nothing in my life has really ever been easy. I've always been someone who has done everything uphill. I'm up for challenges. I'm up for being outside the box. I'm competitive, I love challenges and I'm a little bit of an adrenaline junkie. Throw those all together, and this was the perfect opportunity for me." Hammon began embracing challenges as far back as her childhood in Rapid City, S.D., when she'd play in pick-up games with her older brother and his friends. The boys routinely knocked her to the ground whenever she ventured into the paint, but she gradually learned to use angles to beat quicker defenders off the dribble and to use her body to shield taller, stronger defenders when she went for layups at the rim. Those pick-up games paved the way for Hammon to become one of South Dakota's best players as a junior and senior in high school, but that still wasn't enough for her to garner much attention on the recruiting trail. High-profile programs rarely sent coaches to scout South Dakota because the state is so vast and produces so few Division I prospects. Even those coaches who did see Hammon play were often skeptical whether a 5-foot-6 guard with modest quickness could thrive at the college level. Ex-Colorado State assistant coach Kari Gallegos-Doering became a believer when she watched Hammon outplay far more decorated prospects the summer before her senior year of high school. She remembers arguing with a coach from another staff over whether Hammon or the guard she was up against that day would have a better college career. "I said, 'Nobody can take the ball from her, she's got a quick first step and wait until you get her in shape,'" Gallegos-Doering said. "'And look at her attitude out on the floor and how she elevates the people she's playing with. Isn't that worth another look?' This coach said, 'Nah, my head coach isn't going to go for that. She wants the girl she's playing. That's why I'm sitting here.' I thought, 'That's fine. I'll take the other one.'" The challenge for the Colorado State staff was that neither Hammon nor her family had any familiarity whatsoever with their school. When Gallegos-Doering and head coach Greg Williams watched a BYU-Colorado State football game with the family during an in-home visit, Hammon's mom didn't realize the team in blue wasn't the Rams until halfway through the third quarter. "She said, 'Oh my gosh, Colorado State's in green. I've been cheering for the wrong team,'" Williams recalled with a chuckle. "I had to recruit Becky harder than any kid I've ever recruited, and I've been in the profession a long time. And she was well worth it." Indeed, Hammon and teammate Katie Cronin put Colorado State women's basketball on the map during their four years in Fort Collins, leading the Rams to three NCAA tournament bids and to a 33-3 season in 1999 that culminated with a Sweet 16 appearance. Along the way, Hammon nabbed every individual scoring record at Colorado State and surpassed Utah star Keith Van Horn as the WAC's all-time leading scorer. Remarkably, those achievements didn't earn Hammon much attention from WNBA teams. Even though Williams and his Colorado State successor Tom Collen called every WNBA contact they had to encourage them to take a closer look at Hammon, the 5-foot-6 guard went unselected in the 1999 draft because of familiar concerns about her lack of size and speed. It also didn't help that the 1999 draft was the first since the American Basketball League folded the previous year, forcing college prospects to compete with an influx of veteran players for WNBA draft slots and roster spots. One of the few WNBA coaches who believed in Hammon was Adubato, a first-year coach with the Liberty who knew nothing about the Colorado State star until he happened to watch a game during her senior season in which she lit up the opposing team from the perimeter. Intrigued, he followed her progress the rest of the year and marveled at his good fortune when she went undrafted. Few undrafted free agents make WNBA rosters, but the Liberty had a hole at backup point guard and Hammon took advantage. She impressed Adubato from the outset by taking it right at the team's bigger guards and finishing over taller defenders with an assortment of finger rolls with her left and right hands just like she once used against her older brother and his friends in their driveway. "The thing that impressed me most was her aggressiveness and her toughness," Adubato said. "She had to go against [U.S. Olympic team standout] Teresa Weatherspoon and Vickie Johnson. Both of them were physical, tough, fierce competitors. Her willingness to fight against those two every day amazed me. She looked about 16 years old when she came in, and to pit her against those two really told me a lot. She was fearless, she's a great competitor and she had the heart and the will." Hammon eventually developed into a starter and an all-star in the WNBA because of her passing, ball-handling and shooting skill, but there was one goal she never managed to achieve. Unable to earn a spot on the the U.S. Olympic team, she instead applied for dual citizenship and played with Russia in 2008 and 2012. Some portrayed her as a traitor. 2008 U.S. Olympic coach Anne Donovan called her unpatriotic. Hammon viewed her decision not as a political statement but as a way to fulfill a childhood dream. "I had two choices," Hammon said. "I could either sit at home and watch the Olympics or I could go and take part. It was really that simple. It was a hard decision and I took a lot of flak early on, but once the truth started coming out, I felt a lot of people changed their minds and I felt a lot of love and support through that whole thing." As Hammon's career was winding down, she began exploring her post-basketball options. Two incidents pushed her away from broadcasting and toward coaching. The first was a conversation she had with a broadcasting colleague one day. When he told her the best thing about working in TV was never having to walk out of a gym a loser, she immediately thought, 'Yeah, but you never get to leave a winner either.'" The second was a torn ACL last July that prevented her from playing basketball the next nine months. When she broached the idea with Spurs coach Gregg Popovich about sitting in on a few practices, he enthusiastically agreed. The mini-internship that followed the next 12 months convinced Hammon that blowing out her knee was one of the biggest blessings in disguise of her life. She attended film sessions, coaching meetings and practices, receiving an invaluable behind-the-scenes look at what makes the NBA's most consistent franchise successful. And on the other hand, the Spurs discovered that Hammon possessed a brilliant basketball mind, a passion for coaching and masterful people management skills, exactly the combination Popovich seeks in an assistant coach. Hammon announced earlier this summer that she is retiring from basketball at the end of this WNBA season. Soon after learning that, Popovich offered her a job. "Pop told me, 'I'm hiring you because you're a good fit here, and you just happen to be a woman,'" Hammon said. "I think that just sums this whole thing up great." The news that Hammon was joining the Spurs staff didn't catch Adubato by surprise. He learned never to underestimate Hammon after his conversation with her walking off the floor during the 1999 WNBA Finals. One day a few years later, Reggie Miller attended a New York Liberty walk-through because he was broadcasting the team's game that night. Adubato was so confident in Hammon that he bet one of the NBA's all-time great shooters $100 that she'd make more half-court shots than him. Hammon sank two out of five. Miller hit only one. "I took my $100 and I never let him forget it," Adubato said. So Hammon has already proven she can beat NBA players. Now all that's left is showing she can coach them too.